These project plans are not for the novice as they require someone with substantial wood working experience, and stationary power tools. Playhouse kits are also available which will save time and possibly a lot of frustration. However, the effort involved is well worth the finished product. Your children will have years of enjoyment. A properly prepared foundation, concrete slab, will add years of life to the playhouse. This playhouse plan is available for a small fee. 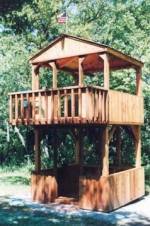 This is the ideal playhouse for kids, grandkids, parents, grandparents, and friends. A playroom is provided on an upper level with a horizontal window between the screen porch and the upper playroom. As an added feature, the window is low to the floor, so kids can be easily viewed. The screen porch is great for visiting with family and friends. A space under the upper level playroom is provided for a sand bed or storage. A fun playhouse for all the family! 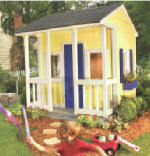 Lowes has detailed plans and instructions for a basic playhouse. Southern Pine has detailed plans on an American Gothic children's playhouse..
Georgia Pacific has detailed plans for this playhouse including the foundation requirements. 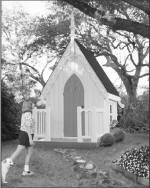 Black & Decker offer detailed plans and instructions for a simple and easy to build playhouse. UBuild has detailed drawings and instructions for a frontier style playhouse. Ace Hardware has plans and instructions for a simple playhouse. Ubuild has instructions and drawings for a two story fort. Ideal for any young frontiersman! UBuild offers instructions and plans for a complex Victorian playhouse.